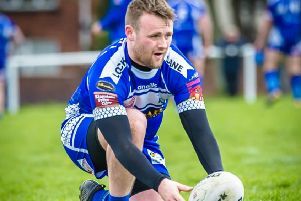 Featherstone Lions let a 24-point lead slip, but still came out on top in a game of changing moods against Oulton Raiders in Division One of the National Conference. Coach Paul Dooley was given plenty of food for thought as his team started and finished superbly to run out 43-26 winners, but lost their way in the middle and were 26-24 behind with 15 minutes left. The Lions started well with Danny Glassell and Gaz Gale going close in the opening stages, but it took some good defence from Dean Gamble to keep Oulton out at the other end. Tom Wandless latched onto a Raiders pass on the Lions line with the home side stretched and hared 50 yards before being held. Jake Perkins then opened the scoring with a clever solo try and Ian Jackson converted to put Featherstone 6-0 ahead. Oulton then had a try ruled out, but the Lions were in control with Ben Mawson having his best game of the season and Jimmy Beckett and Scott Wilson going well in the middle. Gale made a fine solo break before Dean Gamble sent Ricky Williams over for the second try and Jackson added a touchline conversion. A third try soon followed as Wandless gave a nice ball to Jackson. He hared 45 yards down the flank before parting to Perkins who showed a fine pair of heels to speed over. Jackson’s goal made it 18-0. Jackson then put in a deft chip towards the visitors’ line after Beckett was close on a solo run and Williams was inches away from a second try. There was no stopping Beckett just before half-time, however, as he sidestepped his way through for a well earned try. Jackson’s goal made it 24-0 at the break and it seemed it was all over as a contest. Oulton had other ideas, though as they turned the game on its head in the second half. They scored their first try almost from the kick-off and soon added a second converted try. Their big pack started to dominate along with an impressive stand-off, whose chip to the corner got a lucky bounce to bring about a third Raiders try. Danny Glassell made a superb try saving tackle after the Oulton centre raced 65 yards downfield. But fast hands by the visitors saw them score again. When a fifth try followed along with a touchline goal the visitors were 26-24 ahead, but now it was Featherstone’s turn to turn the game round. Mawson and Wilson were sent back into the fray to liven them up and did just that. Captain Jackson held off two defenders to plant the ball over the line and added the goal to make it 30-26. Jackson’s 40-20 kick could not lead to a further score, but the Lions did put more points on the board when Williams intercepted and raced almost the full length of the pitch for a game breaking try that was converted by Jackson. Mawson ploughed over from close range for another try and Jackson added the goal plus a drop-goal to complete the scoring. Lions aim to be TV stars this Saturday as they travel to Wigan to play Rose Bridge, with the game being shown live on the free sport channel.